Protein aggregates are deemed to be one reason for the death of nerve cells in disorders such as Alzheimer&apos;s or Huntington&apos;s disease. As researchers at the Max Planck Institute of Biochemistry report in the current issue of Nature, they have now decoded a new cellular mechanism for the development of aggregates. Missing stop signals in the production of proteins lead erroneously to long lysine chains at the end of the protein. This in turn blocks the ribosomes, the cell&apos;s protein factory. Healthy cells detect blocked ribosomes and rapidly destroy useless proteins. If the necessary quality control machinery does not function properly, defective proteins accumulate and form toxic aggregates. In order to be able to treat neurodegenerative disorders in future, researcher Ulrich Hartl, Head of the Department of Cellular Biochemistry at the Max Planck Institute of Biochemistry, and his team have for many years been studying the cellular causes for the death of nerve cells. A determining cause is believed to be protein deposits - aggregates of misfolded proteins. "We were able to show that the formation of aggregates is promoted by defects in the protein blueprint and these are not detected by the internal quality control machinery", explains Young-Jun Choe, first author of the study together with Sae-Hun Park. In each cell, proteins perform vital functions, acting as small molecular machines. "DNA can be envisaged as a huge library of protein blueprints that are located in the cell nucleus. To manufacture a protein, a copy of the blueprint, the mRNA, is first made. This is then directed from the cell nucleus to the ribosomes, which then build the protein from amino acids", says Choe. Healthy cells have a very efficient quality control process when it comes to the manufacture of protein. Misfolded and useless proteins are selected, repaired or rapidly destroyed. Ltn1p is an important component of quality control. "If Ltn1p is not active in pathologically modified cells or if other components of quality control are missing, defective proteins accumulate and form aggregates in cell interiors", says Park. The protein aggregates that develop have a sticky surface and act as a seed. 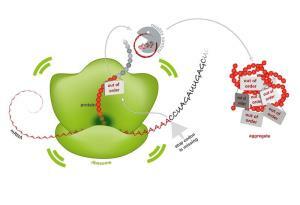 They ultimately also bind functioning proteins, which are free of defects and vital for the cell. As a result, the cell is destabilized and, in the long run, is damaged. Interestingly, according to Ulrich Hartl, the cell seems to follow a known pattern in this regard. "We already know from previous studies on the protein huntingtin, which spontaneously forms aggregates and is responsible for the development of the neurodegenerative disorder Huntington&apos;s disease, that protein aggregates also bind to essential proteins that have no defects." "Our results not only demonstrate a potential mechanism for the development of neurodegenera-tive disorders but we have also found another example of the way in which proteins can form aggregates and damage the cell. This confirms our assumption that the suppression of the aggregation of proteins represents a promising therapeutic approach for a large number of neurodegenerative disorders that are currently still incurable", says Hartl, summarizing the results of the study.